Some pictures from my setup, which hasn't changed that much in the last years. 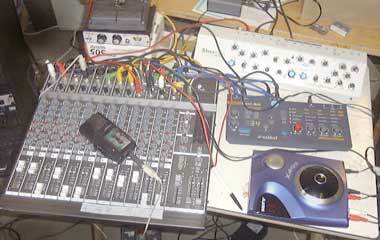 The Behringer indeed has become quite "scratchy", making a lot of noise on its own. I recently even received FM radio with it! 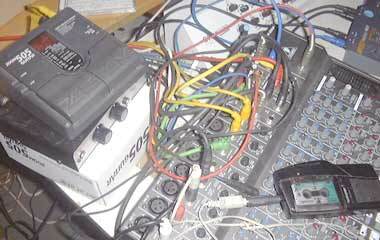 The mixer is in a state of short-circuit, outputs are fed into inputs. This generates feedback which can be manipulated by EQs i.e. 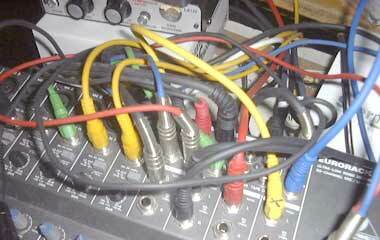 The mixer behaves like an instrument. A small and cheap dictaphone generates weird noise, voices and scratching sounds. 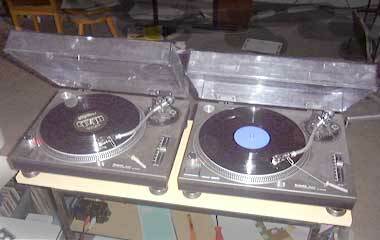 The two Technics turntables give the main input of looped rhythm sounds. I prefer cheap techno records, but any other record goes as well. The screws are the top "secret weapon". They fix the stylus so it keeps in one groove all the time, generating fascinating loops out of random material. 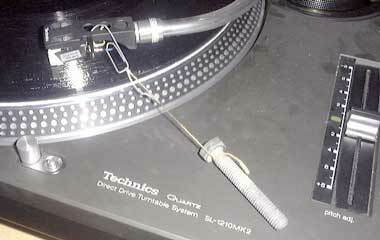 With this technique I have transformed the turntable into a sampler with instant access to every sound piece on the disc. It's much more versatile than a digital sampler: no scrolling through menues to find the right sound any more.